More info:From £1779 - £1879 excluding flights. Prices based on 2 adults sharing. Single supplement available. Mimimum age 14. Once part of the ancient Silk Road, the Caucasus region straddles two continents and links East and West. Is it any surprise then that these countries provoke such fascination among travellers? Travel from Yerevan to Tbilisi as part of a small group, via must-see landmarks including Echmiadzin Cathedral, Haghpat Monastery, Lake Sevan and the Jvari Monastery in Mtskheta. You will walk through magnificent mountain scenery, sample regional favourites such as local wines from Kakheti and lavash bread, and explore a remote cave town, literally carved out of the cliffs in the 12th century. Begin by enjoying the charms of cosmopolitan Yerevan, which is among Europe’s oldest capitals yet has a wonderfully youthful outlook. It makes an excellent base from which to visit the Echmiadzin Cathedral, the oldest in the world. From Yerevan you’ll travel east to Lake Sevan, an immensely popular holiday resort among Armenians, via the ancient Hellenistic temple of Garni, and the UNESCO-listed Geghard Monastery. A wonderful spot for a dip, and a seafood dinner. From the lake you will travel on to Haghpat Monastery, also UNESCO-listed for its outstanding ecclesiastical architecture, before crossing the border into Georgia. Now you can take a relaxing sulphur bath in Tbilisi, or wander the streets of the charming Old Town where so many religions mingle contentedly. You won’t be staying long however, because from the capital it’s on for some light trekking in the beautiful Kazbegi mountains, a short stop in the former capital, Kutaisi, and then another highlight, as you reach the Khaketi wine region where opportunities abound for sampling the local vintage. This outline merely scratches the surface of a fast-paced itinerary that covers more in the space of two weeks than most would in a month. Expect long but rewarding days that ensure you get to see the very best of Armenia and Georgia, on an authentic and captivating tour. We travel in small groups which helps us to minimize our impact on the environment. 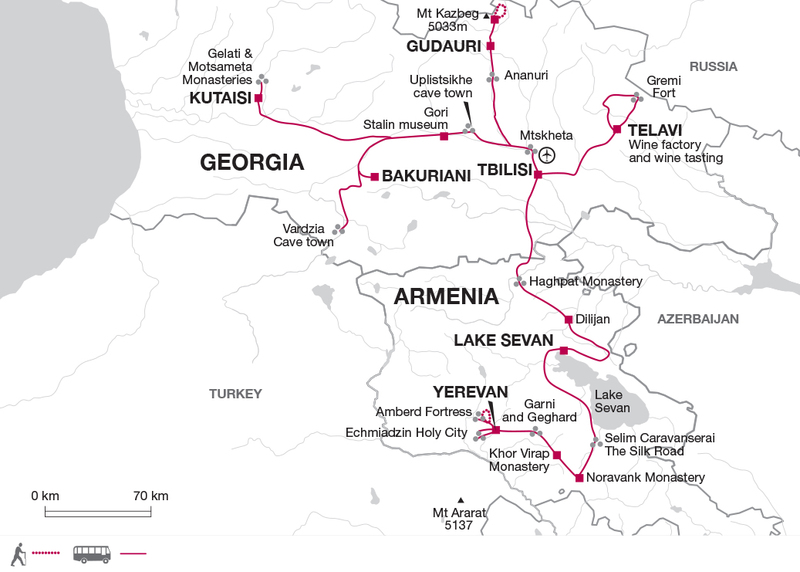 Despite the distances involved in getting around Georgia and Armenia we only travel by bus. As our groups are small we are not using the larger, less efficient coaches to transport our customers. On several days during the trip we will walk to many of the attractions that we are visiting. This reduces our reliance upon motorised transport and gives customers the opportunity to experience the true environment. In particular we undertake walking tours of the towns that we visit, such as Tiblisi, rather than touring the city by bus. Re-usable water bottles are always part of our recommended essential items to bring on tour so that we reduce the use of plastic water bottles and therefore plastic wastage. Georgia and Armenia are a cultural treasure trove, not only for their historic sites but for their traditions and heritage. We always want to show you as much of the real country as we can so we employ a local tour leader and variety of local guides who can really bring the culture to life for you in an authentic way. Staying in small and relatively out of the way places and using local guesthouses really brings us closer to the local culture and gives us many opportunities for unique experiences. Using local guides and crew is consistent with our policy to generate local employment and deliver direct economic benefits to the areas we are travelling in. We also do this by using locally owned hotels, spreading our business to a variety of local restaurants. In this area which was relatively isolated until recently, the income we generate is really significant to these small businesses. It is important that the people who work for us are treated fairly and confident in their work. This is why we take care to train all our local tour leaders and give them all the support they need to do their job well. which still retained valleys of snow, in the bright clear air. crossroads of Europe and Asia. The holiday put money into the local economy. The people were keen to retain and repair their inheritance. It was great. These small group holidays are made by and very dependent on the quality of the guides and the sharing of the travellers. We learnt so much.